Shirts With Random Triangles: Ohio State adds high school safety Tyler Green to its 2015 recruiting class. 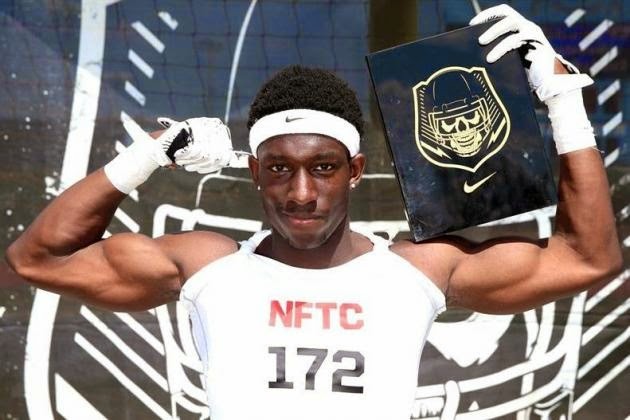 Ohio State adds high school safety Tyler Green to its 2015 recruiting class. Tyler Green. Photo via Bleacher Report. Ohio State has added the fourth member of its 2015 recruiting class. Hyattsville, Md. high school rising senior safety Tyler Green committed to Ohio St. on Sunday after being offered a scholarship at a camp held at the school on Sunday. Green is graded as a three-star safety by Rivals.com. The recruiting site ranks Green at no. 9 on its list of the top recruiting prospects out of Maryland. Green is ranked and at no. 18 on the Rivals.com list of the top safety prospects in the country. Green attends DeMatha Catholic High School in Hyattsville, Md. He stands 6'2", and weighs 189 lbs.